Are You New To Sleep Apnea Treatment? Are you having trouble sleeping at night and think that it’s time to see your GP? Have you seen a sleep professional, and they’ve talked to you about sleep apnea? Or, have you actually begun treatment? No matter what stage you’re at, knowledge is power. The more you know about sleep apnea and its treatment, the more comfortable you feel about it all. At EdenSleep, we recommend that you take the time to do your research, but it can be quite time consuming and overwhelming. So, we decided to put all the information in one article, so you can read through all the basics to get you started on your journey to a better night’s sleep. Sleep apnea (sometimes spelled sleep apnoea) is a sleep disorder where your natural breathing pattern is briefly paused or interrupted entirely during sleep. 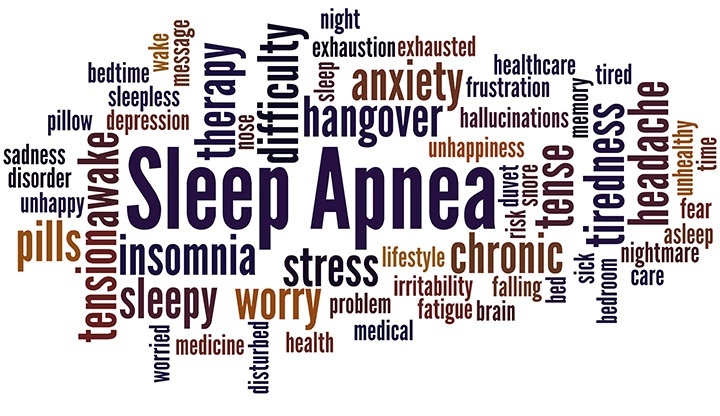 There are a few different types, but the most common is known as Obstructive Sleep Apnea (OSA). This occurs when the muscles in your throat controlling your upper airway relax too much while you are asleep. If this happens, the upper airway becomes constricted and you may begin to take shallow breaths or snore. If the airway constricts even further, it may become completely obstructed, causing you to temporarily stop breathing. Sensing this, your brain will force you to cough, choke or snort to clear the airway passage and resume normal breathing again, which disrupts your sleeping state. Typically, you won’t fully wake or even remember it the following morning. This wouldn’t be so much of an issue if this only occurred occasionally, however, people with sleep apnea experience this several hundreds of times a night! This continual disruption to your sleep patterns, combined with the constant restriction of oxygen results in a poor quality sleep every night. Unfortunately, this takes a toll on your system and can put you at risk of other more serious health complications if left untreated, which is why treatment is available and should be considered. However, keep in mind that everyone’s circumstances are different. Symptoms like these are frustrating enough every once in a while, but when they occur regularly, it may indicate that you suffer from sleep apnea, and it’s recommended to go see a Sleep Professional or a GP. They can assess your situation and diagnose you correctly, because left untreated, sleep apnea can have a significant impact on your health. How does sleep apnea affect your health? Sleep plays an important role in maintaining both our physical and mental health. The frequent disturbances in your breathing during the night caused by sleep apnea can prevent you from getting a healthy amount of quality sleep. This can lead to irritability and sickness which can impact your quality of life, your work and event your relationships. But besides these more general impacts, there are more serious health concerns related to sleep apnea too. The lack of oxygen and strain on the body over longer periods of time can take its toll. Some of the other known risks linked to the disorder are hypertension, obesity, stroke, heart attack, Type II diabetes, high blood pressure, and even increased susceptibility accidents. However, there are treatments available to help manage the more general symptoms which affect their daily lives, as well as reduce the risk of the more serious issues. It is recommended to seek professional advice about sleep apnea solutions as soon as possible to avoid ongoing and increasing health complications. guide on the 8 ways you can sleep better tonight. There are generally four common sleep apnea treatment options available to you which can assist in alleviating symptoms and restoring your healthy sleep routine. We can discuss with you your best options for addressing your sleep concerns. A Continuous Positive Airway Pressure (or CPAP) machine is a device which delivers a continual flow of air from a pump through a tube to a mask that you wear, to keep your airways open and fully oxygenated. This eliminates the need for your body to continually rouse throughout the night to restore normal breathing, allowing for a more restful sleep. CPAP is the most commonly prescribed option because it’s an effective and non-invasive treatment that produces successful results. Similar to the above, an Automatic Positive Airway Pressure (or APAP) machine works in the same way, however automatically varies its air pressure throughout the night in response to a person’s needs, offering a more tailored treatment. Bilevel therapy is typically used when someone needs a specifically high pressure for effective treatment. A Mandibular Repositioning Device (or MRD) is a non-invasive, custom-fitted mouthpiece that holds your jaw in a forward position while you sleep to expand the space behind your tongue. This helps keep your upper airway open, preventing the airways from becoming restricted. They’re proven effective for people with mild and moderate obstructive sleep apnea, who cannot tolerate CPAP. A far less common option, there are several surgical procedures that can improve the exact area of obstruction in your upper respiratory tracts, however, as with all invasive surgical procedures, there is the risk of negative side effects. Quitting smoking, avoiding excessive alcohol and losing weight are all more general ways to treat sleep apnea by reducing the potential contributing causes. For example, in some patients with milder forms of sleep apnea, losing weight can help decrease the fat deposits around the neck, thus reducing the disruptive breathing throughout the night and alleviating the symptoms. Sleep apnea treatment: feel like a new you! Being diagnosed with sleep apnea and having to undergo treatment can be an overwhelming thought at first. However, the benefits of reducing the symptoms will allow you to reclaim your quality of life and will quickly outweigh any negatives you may experience. You’ll feel like a new you when your prescribed treatment option restores your healthy sleep patterns and you begin to rest well again each night. Nevertheless, here are some ways to make your treatment much more manageable. If you have a CPAP machine as a part of your Sleep Apnea therapy, both consistency and compliance of use are the two most important ways that you can maximise its efficacy to get a better night’s sleep. Consistency comes from using the machine during every sleep as instructed, and compliance means using it as intended. To help you get adjusted to this, here are a few tips. Some people can find the CPAP machine’s mask intrusive or the hum difficult to ignore. So instead of immediately strapping it to your face and turning on the air on the first night, perhaps simply hold it to your face first and wait a few moments to become more comfortable. Next, turn on the pressurised airstream and slowly acclimatise yourself to that sensation and the noise too. After this, the next step is to finally strap the headgear on and see how you feel. The use of stages helps ease you into getting comfortable with the mask through gradual introduction. Fitting your mask well is an important part of your treatment. Small adjustments can make all the difference to comfort and effectiveness, so ask your Sleep Professional to show you the best way to put on your mask. This way, you can fit it perfectly to the contours of your face, the way it is designed to be. Then practise at home before bed in front of a mirror to get a good seal and put you at ease. After all, you won’t be able to sleep if you’re uncomfortable. If you share a bed with a partner, it’s important to involve them. After all, you’ll be wearing a mask into bed and turning on a machine all night as you both sleep! Explain how the device works, and what it does for you. You may even have them help you with the mask when you need it. This will put you both at ease and make the treatment become a natural routine. This means that you should maintain healthy habits when it comes to sleeping, such as listening to your body’s internal clock to judge when you’re ready for sleep, and when you are not. In addition, have a good mattress and pillow to ensure you are comfortable, and don’t consume stimulants like coffee before bed, as they can make it difficult to fall asleep. It’s hard enough to go to sleep with a busy, racing or worried mind, let alone throwing in your therapy machine and mask. Instead, just before you head to bed, listen to some calming music, meditate, take a bath, or read a book. This will put you in the right state of mind, before equipping your machine and snuggling in. Many CPAP devices now come equipped with a Sleep Onset Detection feature, where the machine will begin at a low pressure and won’t ramp up to the prescribed pressure until it detects that you have fallen asleep. This means that, while you are lying in bed with the headgear on, you won’t feel the full pressure of the air until after you have drifted off and no longer actively aware when the oxygen increases. This can greatly ease the uncomfortable feeling, while ensuring your treatment is effective. We hope that you are now feeling empowered about sleep apnea treatment and are ready to take your next step in restoring quality sleep to improve your health and well-being. Heeding all of the advice and information will set you on the road to reclaiming your quality of life. But remember that it takes a while for most people to get comfortable with treatment. 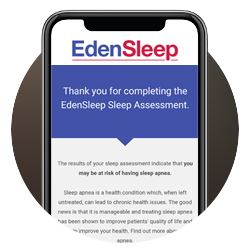 If you are experiencing problems getting enough quality sleep and you believe it may be sleep apnea, you may wish to consider undertaking a free online sleep assessment to better understand how to improve your restful state and your overall health. The assessment only takes 60 seconds and asks you a series of simple questions designed to help you uncover the cause, then conveniently sends the results to you via an email. Think you're experiencing symptoms of sleep apnea? Meurice et al. ORCADES: A prospective cohort study of obstructive sleep apnoea (OSA) patients receiving second-line treatment with a mandibular repositioning device (MRD). Eur Resp J 2013;42(57):1056S. EdenSleep. Can’t sleep or having trouble sleeping? https://www.edensleep.co.nz/trouble-sleeping. 6/1/2018. ResMed. Sleep Apnea Treatment Options.